Are Sandwiches the new Smartphones? Phone Replaced With Sandwiches is a hot new blog dedicated to replacing smartphones in stock photos with sandwiches. It might sound like an odd question – why would sandwiches be likely to replace our favourite technology – the smartphone? You can't even check your Facebook on them! However, that's exactly what one Tumblr user is doing with their blog Phone Replaced with Sandwiches. The blog does exactly what it says on the tin – it replaces the smartphones found in stock photos with a variety of sandwiches using Photoshop. A waste of time, you might think, but we disagree. The results are hilarious! Totally awesome and timewasting. The beauty of the transformation lies in the nature of stock photos. Images with smartphones are usually intended to put across a particular message about the phone; that it's hi tech, hip, and cool, or easy to use for example, and they usually achieve this with minimal subtlety. Take away the context of this message by replacing the smartphones with sandwiches, and you're left with pictures of people looking pretty ridiculous. 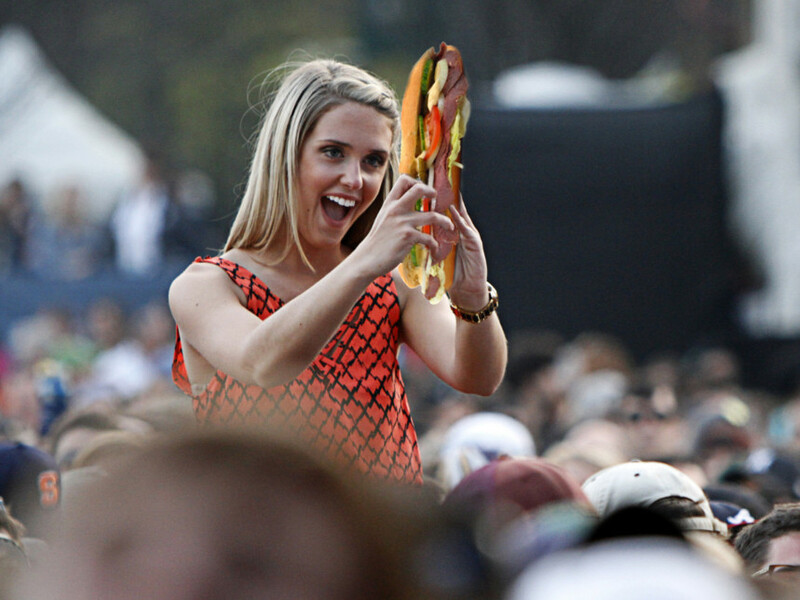 Take, for example, the girl at a festival or concert, having the best time as she holds a massive sub into the air to record the moment. Or the group of friends, grinning manically as they stretch a rib which in front of them at arm’s length. Oh, you guys! That's not how you take a selfie! While the humour comes from the unlikely comparison, from the comical idea of using something you eat for the same purposes as an advanced piece of gadgetry, the blog does prove an interesting point. However absurd it might seem to have a sandwich doing something like taking pictures, not so long ago it was just as ridiculous to imagine doing the same with a phone! Although it's incredibly unlikely that we'll ever be browsing the web on sandwiches (though you never know, maybe we should patent that idea? ), the blog does help highlight how far technology has come. No longer are phones just for making calls, or even sending texts and emails; you now have the whole internet in your hand, as well as a games console, camera, and music player, all in one. What will we be able to use them for next? Follow Sprout's board Are Sandwiches the new Smartphone? on Pinterest.